I’ve been involved in voluntary STEM education in the community through Coderdojo on and off for about 4 years, (more off than on recently though), and projects on Instructables (with over 750,000 views). Over that time, I’ve seen how kids engage and disengage, how they learn, and how they get frustrated. I’d like to share some of those thoughts here. Any learner, particularly kids, need to see the purpose of an activity. They want to know they’re going to achieve something like building an Internet Radio, making an LED blink or move a Sprite on screen, and they need to know how they did it. It is not enough just to complete the activity. I see the best results when kids may achieve less, but learn more. They also need the support to do this. Google and Stackoverflow, for self driven learning, and supportive mentors in environments such as Coderdojo, fill in the knowledge gaps, answering specific queries. 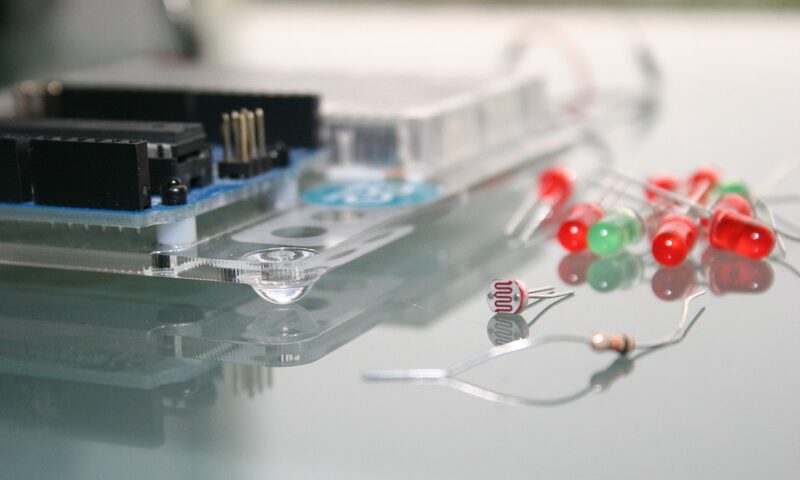 You can also find Arduino Tutorials on this site. But completing activities, even in the most supportive environment, is not enough to lead to long-term learning. For that you need to really cement fundamental concepts and encourage those concepts to be combined through active learning. Structured learning is required for this. Giving the learners a target to achieve, the concepts to achieve it, guiding them through and celebrating success. Coderdojo understands this and recognise and reward achievement with a Belt system. With these principles in mind I developed Tech Cards along the lines of Coderdojo Sushi, but with a clear principle of one-card-one-concept in a handy A6 format. The Concept cards introduce basic concepts and the Project cards present the users with a challenge to combine the concepts of the other cards to complete a Project. A simple Project example is to make an LED illuminate based on light level (LDR) by combining concepts such as conditionals (IF) and basic concepts (Blink). The principles of one-card-one-concept and combination are deliberate and important. They contribute to learning in several ways: i) foundational concepts; ii) structured active learning; iii) encourages combination of ideas and concepts. My experience is that these cards present kids with a purpose and structure. When forming the basis of activities in a supportive environment, where the kids can be guided through to completion, they have been very effective. You can find the cards PDF and editable DOC on Github. Please feel free to give feedback for further development or PULL requests with your own. Gary on Arduino Frequency Detection: How do you detect frequencies reliably in a noisy signal?